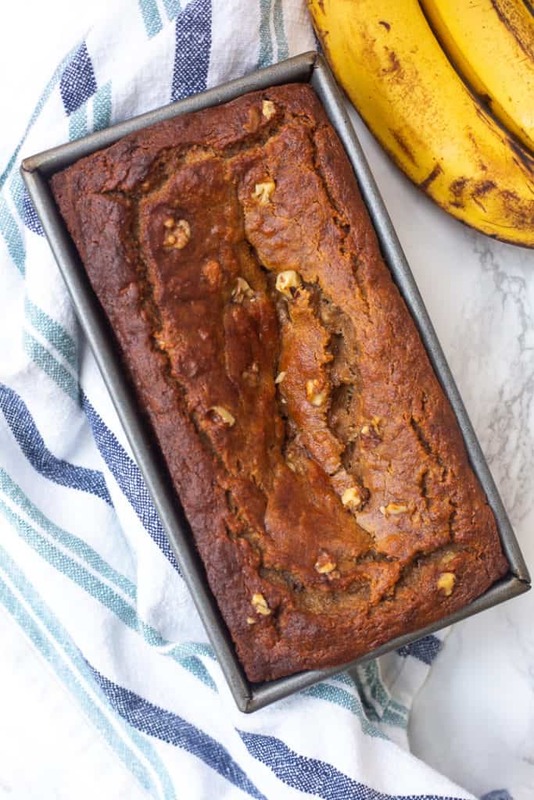 This almond flour banana bread has simple ingredients, plus a texture and taste that’s really similar to typical banana bread. Since bananas are naturally sweet, this recipe has just a touch of added honey. 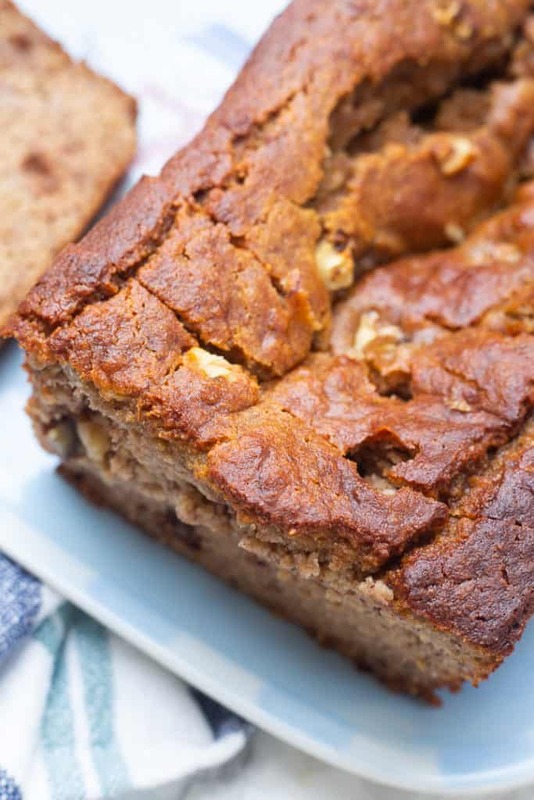 I shared my all-time favorite healthy whole-what banana bread a while back, and today, I’m sharing the new almond flour banana bread recipe that my mom has started making! My parents both follow mostly grain-free diets, so she’s started making a lot of recipes like this. 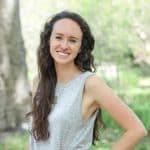 While I generally do eat some grains, especially oats and rice, I always enjoy finding delicious, new recipes that fit a variety of dietary needs. There are a lot of alternative flours out there, including coconut flour, almond flour, chickpea flour, oat flour, and more. Usually, in terms of texture and taste, almond flour recipes turn out pretty similarly to recipe that use white or wheat flour (more so than coconut flour recipes, for example). 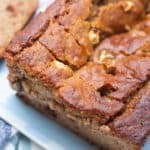 I really like that this recipe using almond flour tastes similar to the banana bread I knew and loved growing up. Recipes that call for oat flour are also typically a good bet for gluten-free diets, and I may work on a recipe for oat flour banana bread next! One downside of using almond flour is that it can be a bit pricey, but we often buy it at Costco for a great deal. You can also often buy almond flour in the bulk bins of a regular grocery store or just in a bag on the regular shelves. I’ve also seen it at Trader Joe’s, Whole Foods, Kroger, and a bunch of other grocery stores. Depending on the store, you’ll likely find it in the health food section or possibly in the the baking aisle. 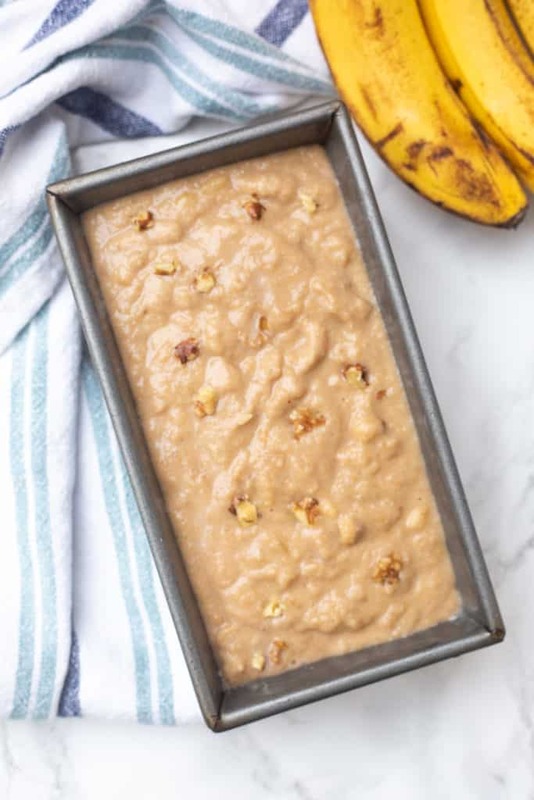 • For easier clean-up: The next time I make this almond flour banana bread, I’ll line the loaf pan with parchment paper. I use this natural unbleached parchment paper! • To avoid using two bowls: Instead of mixing the dry ingredients in one bowl and the liquid ingredients in a different bowl and then combining the two, I like to start by mixing the liquid ingredients in a large bowl. Then, I add the dry ingredients all together on top (see the second photo in this post, above). I lightly stir just the dry ingredients on top to combine the almond flour, cinnamon, nutmeg, salt, and baking soda, and then I mix all of the ingredients in the big bowl together. You’re definitely welcome to use two bowls, but I like that this method prevents dirtying an extra bowl just to stir together the dry ingredients, and it totally does the trick! To prevent the top of your banana bread from getting too brown: Loosely cover with aluminum foil for the last 20 minutes or so of baking. If you try this almond flour banana bread recipe, leave a comment & star rating below or take a photo and tag me @livbane on Instagram! I’d love to see! 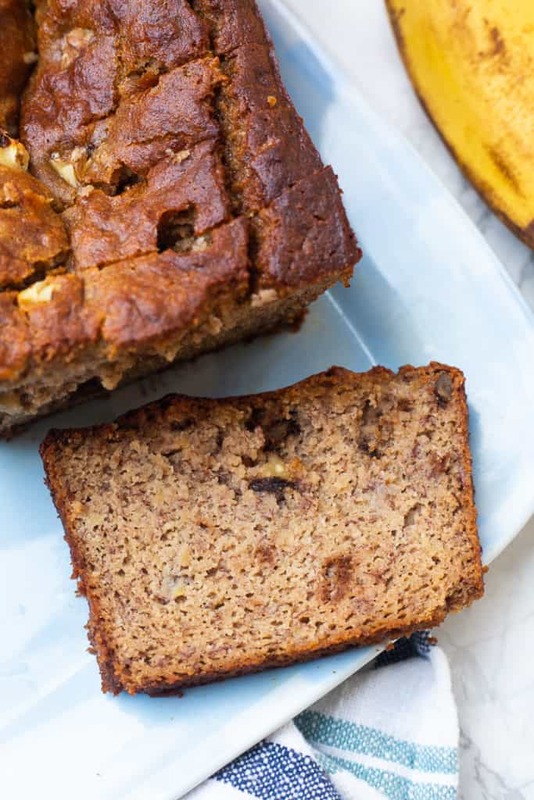 My mom's almond flour banana bread has simple ingredients, plus a great texture and taste that's really similar to typical banana bread. Since bananas are naturally so sweet, this recipe has just a touch of added honey. In a large bowl, whisk together eggs. Stir in honey, yogurt, mashed bananas, and vanilla until combined. On top of liquid ingredients (without stirring), add dry ingredients: almond flour, cinnamon, nutmeg, salt, and baking soda. Gently stir together the dry ingredients on top and then stir dry ingredients to combine with liquid ingredients. Fold in chopped nuts. Pour the batter into a loaf pan and bake for 50-60 minutes until the center is firm when jiggled and a toothpick inserted into the center comes out mostly clean. Run a knife around the edges of the pan to loosen, and then allow to cool for at least an hour. Remove from pan and allow to finish cooling on a wire rack.